Make an easy chunky chain necklace using items from your craft stash. 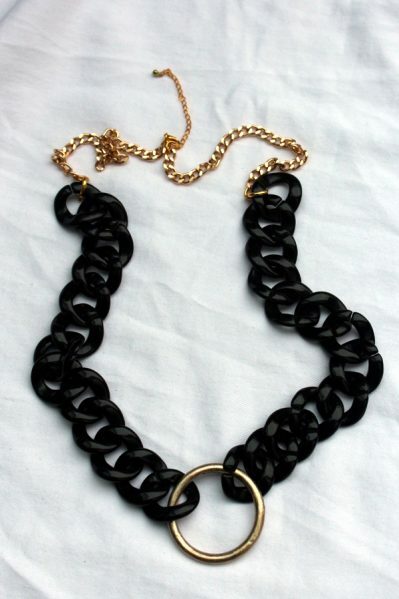 This necklace was inspired by one seen in a street fashion photo from New York Fashion Week that appeared on NYMag.com. I already had some black chunky resin chain on hand but it seemed to lack something. The simple gold ring makes the necklace. 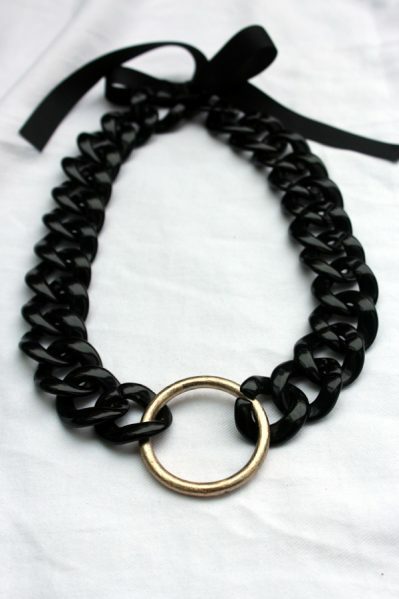 Black plastic link chain can be purchased from a hardware store or pet toy supplier for less than $1 a foot or a style of chain that lays flat is available from jewelry suppliers. The gold ring can be duplicated using an O ring, which can be purchased for a few dollars from retailers who sell purse hardware. However, a less expensive option that requires no shipping is to take an O ring from a beat-up old purse. (Tip: Never throw out a damaged purse without stripping the hardware.) Here is the smaller O ring I used. And a larger but slimmer one. You can brighten up the metal with a gold spray paint intended for metal like Krylon or Rust-Oleum. Or, if you’re not in a position to be spray painting, then try my new favorite DIY product – nail polish. Divide your chain into two even sections to the length you like. Then simply snap the ring on to the end of both pieces. You can finish the ends with two pieces of dollar store ribbon or use chain. I used a Styled by Tori Spelling necklace top and connectors that I already had on hand. I have ended up wearing this super simple necklace more than some fancy ones I’ve spent hours working on. This is fabulous! Great statement for just a few bucks. Love this 1 you have some great ideas! I love this!! And what a great tip about old purses; I would never have thought of that. I love this and was really excited to make it, but when I walked into Home Depot tonight and asked for plastic chain, they had NO idea what I meant. Can we get a link to where this chain was purchased? After much Googling, I’ve only been able to turn up one brick-and-mortar vendor in NYC, 2000 miles away. Disappointed to not be able to source this–I’d really hoped to make this as a Christmas gift. I found a variety of chains at Lowes and was able to have each cut in two equal pieces. Also found rings there in same aisle as chain.